A flood warning remains in place for the North Tyneside coast during this afternoon’s high tides. The Environment Agency has issued the warning for high tides at Whitley Bay, Cullercoats and Tynemouth from 4.45pm to 6.15pm. 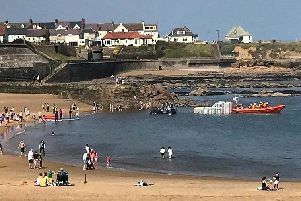 It says the key areas of concern are the Whitley Sands Refreshment Kiosk, Crusoe’s Café and Tynemouth Lifeboat Station. Wave overtopping is likely at these times, although conditions may apply two to four hours either side of high tide.